Contrary to conventional heating systems that require plumbing, duct work, complicated wiring, and difficult and expensive installation, SolaRay infrared heater installation only requires a simple electrical connection, just like a ceiling light fixture. SolaRay panels are light, thin, energy efficient and the panels come in either 120V or 240V models. They can be mounted on the ceiling, which we recommend to gain the best efficiency, or on the wall if so desired. 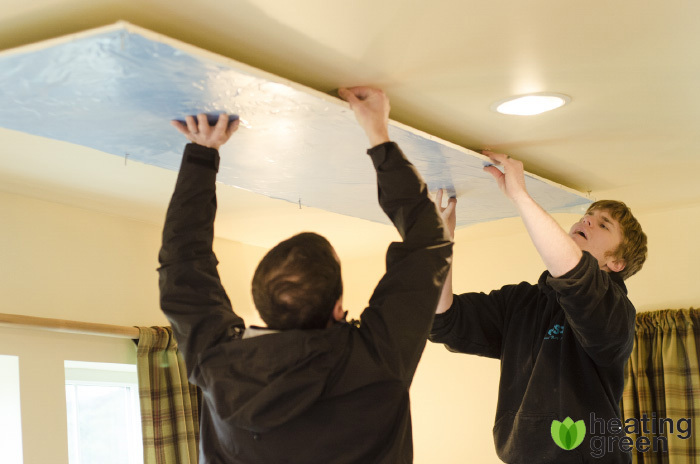 The installation is done by mounting the panel to the ceiling (or wall) with toggle bolts, connecting to 120V or 240V power source and then to a wall-mounted thermostat. Shown here are sample pictures of installers working with our panels.